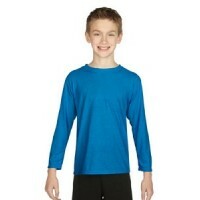 Gildan Youth 5.3 oz. 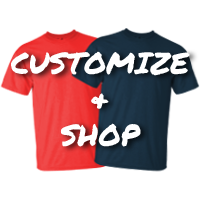 Long-Sleeve T-Shirt | T-Shirts | Apparel Solutions - Creative Sign Solutions, Inc. Rough and tumble young people need shirts that can withstand an active lifestyle and great amounts of use. 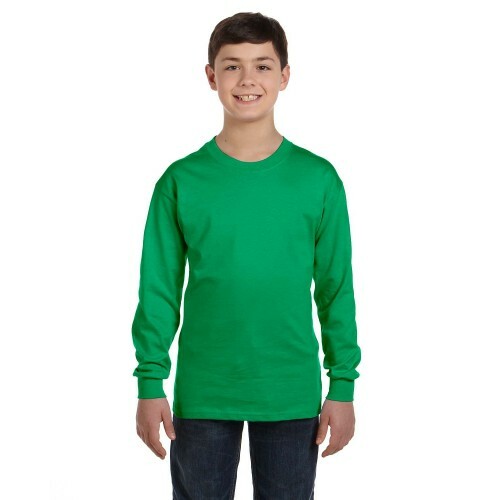 The Gildan G540B Youth 5.3 oz. 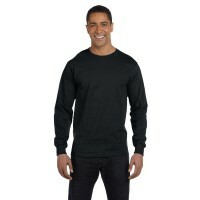 Heavy Cotton Long-Sleeve T-Shirt is designed with a heavier jersey knit fabric that enhances the durable design of Gildan’s classic t-shirts, but with long sleeves that provide warmth and protection. 100% preshrunk cotton means the size and style will remain true after laundering. Points of wear, like the seamless 3/4" neckline and bottom hem, are double-needle stitched for added durability. Neck and shoulder taping add comfort by covering the raw edge of the sewing construction, while enhancing composition. Your child will enjoy being able to easily remove the tag, but the CPSIA tracking-compliant label will remain in the shirt for future reference if needed. Rib cuffs allow the sleeves to be pushed up and remain in place, while ensuring they will bounce back into shape when the shirt is removed and washed. Unisex styling and color options make this a suitable shirt for direct print applications as well.